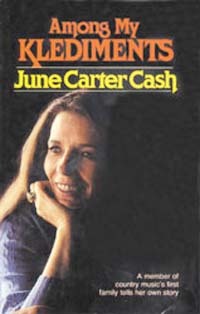 "Klediment is mountain language for anything that is precious and has earned a right to be a part of things close to you," says Jun Carter Cash as she begins her delightful autobiography. "In these pages I want to share with you some things which are precious to me, my loved ones and special moments, my hard times and my good times." And share she does. From her earliest childhood memories in the mountains of Virginia...to her ambition and success as a comedienne and country music performer...to her life with husband Johnny Cash and their seven children. Woven throughout her personal story are treasured photographs and her own homespun poetry. June's heritage from her father Ezra and her mother Maybelle Carter—one of the most beloved figures in country music—is a living part of the American legend. Because of this, June Carter Cash is a fascinating combination of down-home country girl and famous entertainer. While she has performed for presidents and queens and mingled with those who make the headlines, she is first a dedicated Christian wife and mother. Warm, witty, and intensely honest, June is just about everything you'd look for in a good friend. Now she invites you to pour a cup of tea and relax with this book. And you'll be certain she is sitting across the table from you as she shares herself in this album of her klediments.